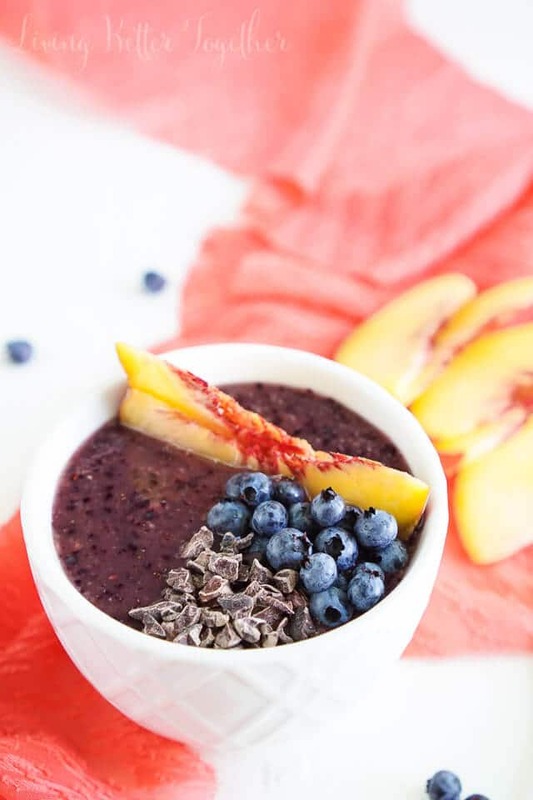 This simple and light Blueberry Peach Smoothie Bowl is both gluten and dairy free. Blend it up in minutes for a breakfast that’s loaded with antioxidants, calcium, and flavor! Blueberry season is in full swing here in Maine, which means it’s time to start working them into everything from pie to barbecue sauce! Blueberries are full of flavor and antioxidants and add a subtle sweetness to everything they touch. 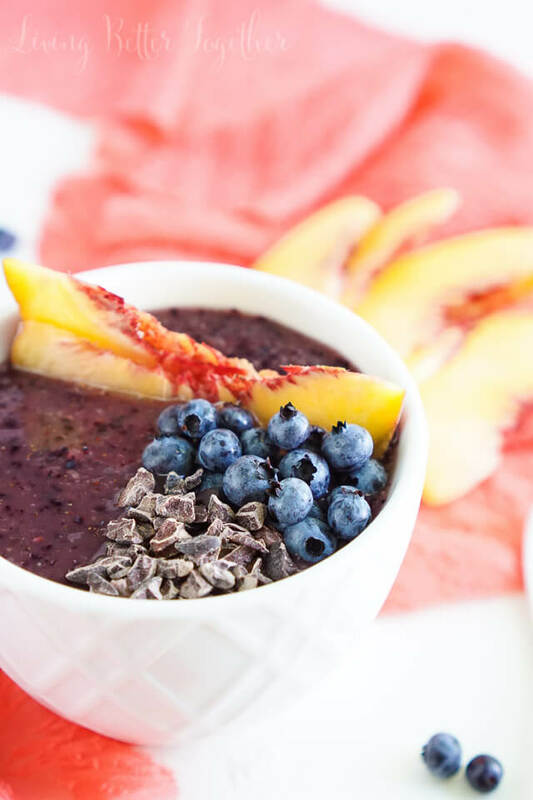 They’re also a fabulous way to start the day and since I’ve been on a smoothie bowl kick, that’s what we’re having! I’m totally digging this smoothie bowl trend right now, it’s a great way to eat a full and wholesome breakfast without feeling loaded down. Plus I love how easy they are to customize! I used Silk Original Cashew Milk to make this dairy free and it’s gluten free too. I used honey to sweeten things up a bit, but you could totally sub in agave for a vegan breakfast! I love that it’s still a smoothie but the additions give me something to much on, making it feel like I’m actually eating my breakfast instead of throwing it in a tumbler with a straw and calling it good. I need a tasty breakfast to get me going each day and feeling good. I couldn’t just stop with blueberries though, I mean, have you ever known me to keep things simple? Or as my husband refers to it, an aversion to the mundane. But hey, you gotta keep like interesting, right? So anyways, to add a little extra summer flair to this smooth bowl I added in a peach, it’s like bringing the Northeast and the Southeast together in a dish and it’s delicious! I finished my bowl off with some peach slices and blueberries as well as a some cocoa nibs. 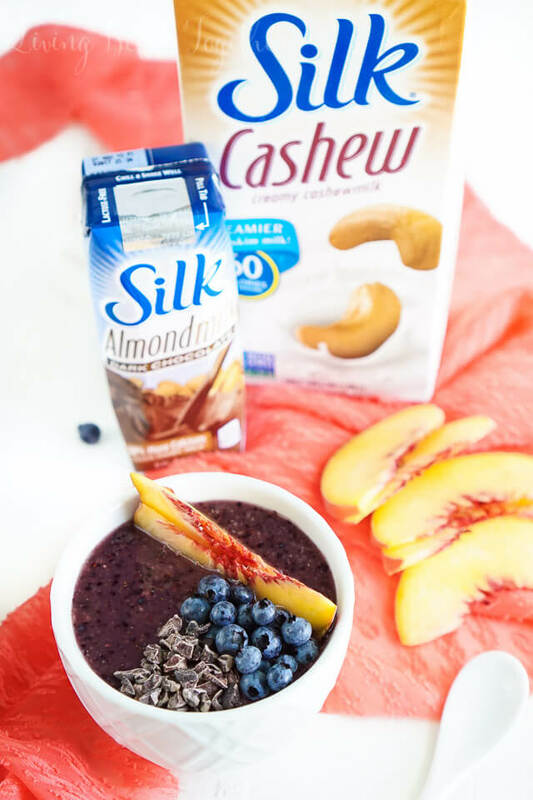 The Silk Cashew Milk makes the smoothie creamy without the addition of yogurt and less calories and sugar than traditional milk. 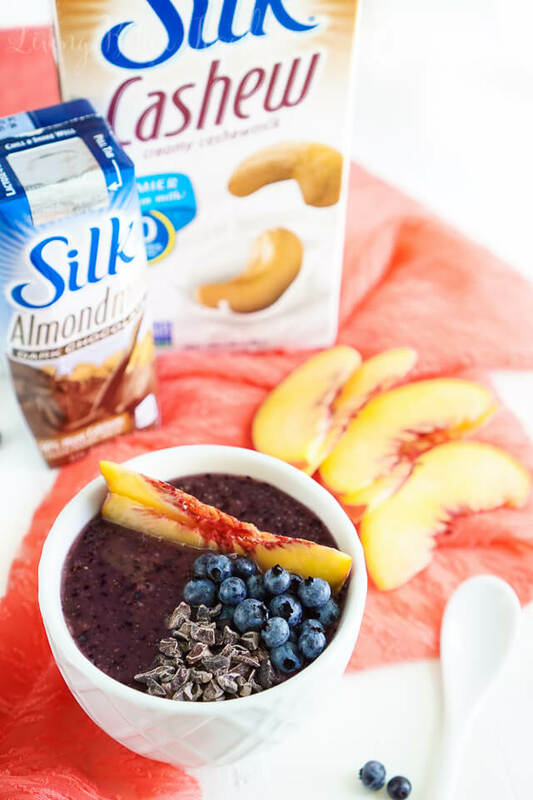 Silk now offers Cashew Milk in Vanilla and Chocolate, um… YUM! Plus it’s Non-GMO and After I finish my breakfast, I always grab a Silk Single on my way out the door to help tie me over for lunch. With only 120 calories and 50% more calcium than dairy milk, it’s a great way for me to curb those sweet cravings, especially with the chocolate! It’s so rich with a silky smooth taste and I love that there’s no added artificial sweeteners or anything like that. I’m thinking it might fall victim to my next smoothie bowl. Pumpkin Chocolate Smoothie Bowl, anyone? Find more great recipes made with Silk Milk at the Nurturing and Nutritious Social Hub, that Peach Mango Bunt Cake is calling my name! Which one is a must make for you this week? 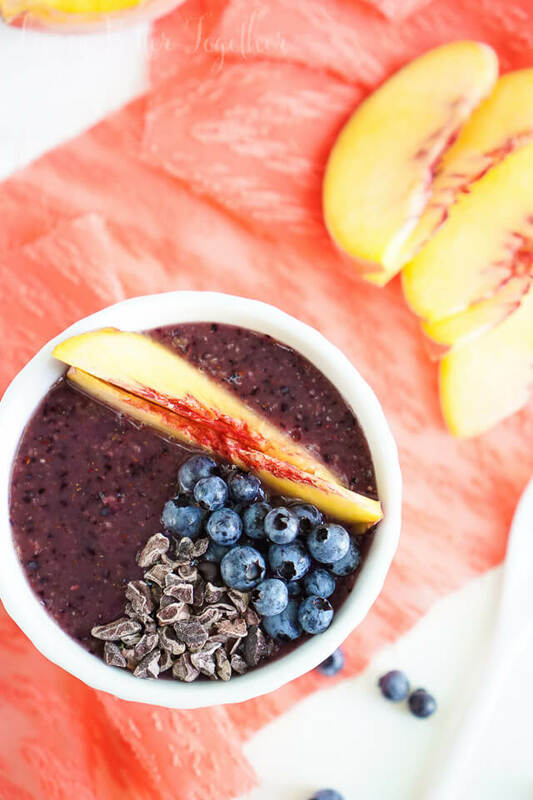 This simple and light Blueberry Peach Smoothie Bowl is both gluten and dairy free. Blend it up in minutes for a breakfast that's loaded with antioxidants, calcium, and flavor! 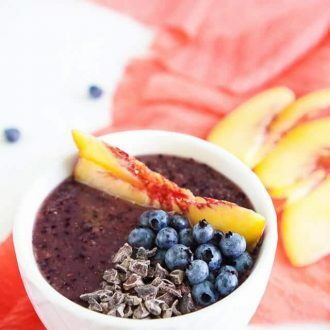 Combine all of the smoothie ingredients in a blender and blend until smooth, pour into a bowl and top with garnishes. Silk Almond Milk and also be used. 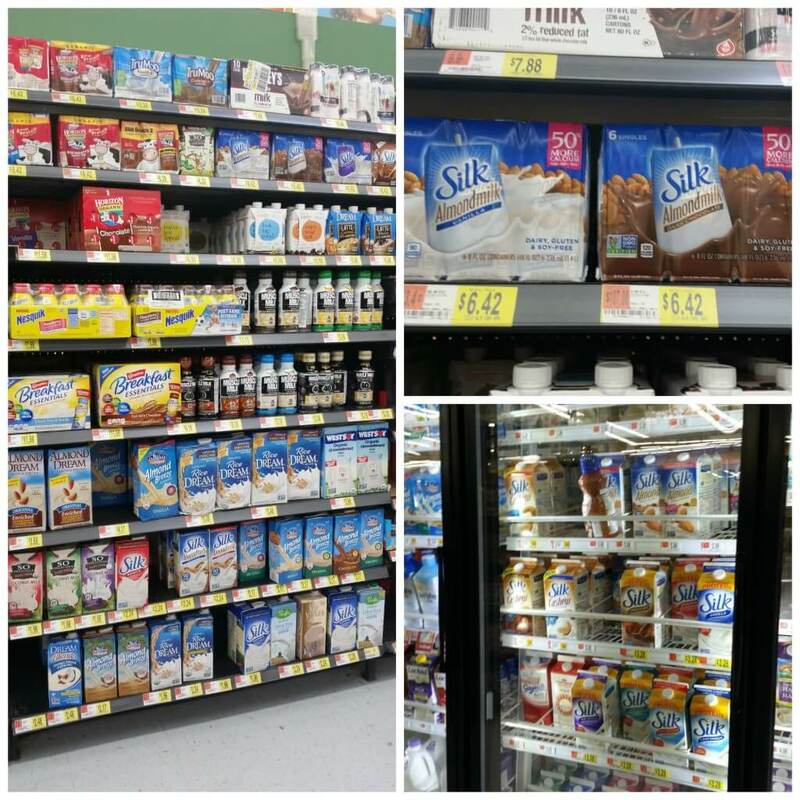 Pick up all your Silk Milk products at Walmart! I have never heard of a smoothie bowl! But I love the concept of it 🙂 And I think it was a smart choice to add those cocoa nibs 🙂 Yum!